Point Pleasant defenders Brooke Warner (24) and Naomi Meisser apply pressure to a Poca player during the first half of Tuesday night’s girls basketball contest in Point Pleasant, W.Va.
Point Pleasant freshman DaNayla Ward (12) releases a shot attempt over a Poca defender during the first half of Tuesday night’s girls basketball contest in Point Pleasant, W.Va.
POINT PLEASANT, W.Va. — Basketball coaches often reference the fact that teams want to get better as the year progresses. John Fields knows just how far his Lady Knights have come after Tuesday night. 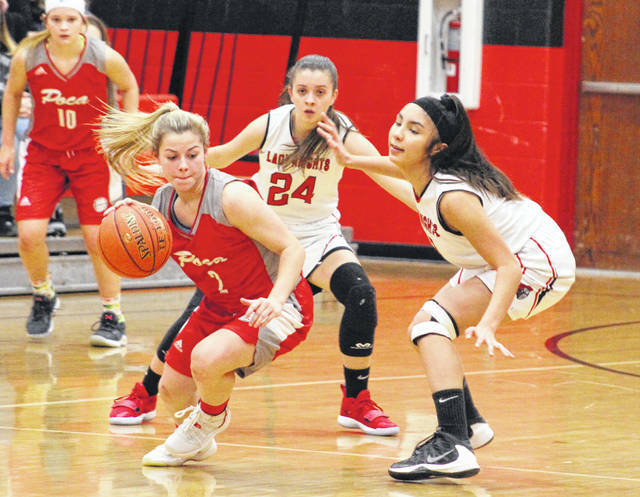 After dropping a 51-29 decision at Poca in the season opener, the Point Pleasant girls basketball team maintained its hot hand and pulled off a 42-40 victory over the visiting Lady Dots on Tuesday in a non-conference matchup in Mason County. The host Lady Knights (5-16) trailed for only 33 seconds in the 32-minute affair and led the final 6:49 of regulation while picking up their first two-game winning streak of the year — not to mention their third victory in four outings. The Red and Black also started the night with only seven players available on the roster, while PHS (3-18) had only eight healthy players available for the game. With 16 seconds remaining in regulation, Point was down to just five people while clinging to a slim 40-37 cushion. Following a timeout, the Lady Knights executed a press-breaking run-out to perfection as Naomi Meisser tracked down a full court pass and completed a layup conversion that resulted in a 42-37 advantage with 12 seconds left. Autumn Smith converted the second of free throws with one second left in regulation, but the miss on the final of three attempts led to an offensive putback by Jesica Pontier right before the buzzer sounded — ultimately allowing Point Pleasant to wrap up the two-point triumph. The Lady Knights built a quick 5-0 lead and were ahead 10-4 through eight minutes of play, then twice built leads of nine points — the last of which came at 16-7 after an Allison Henderson trifecta with 3:45 left in the half. 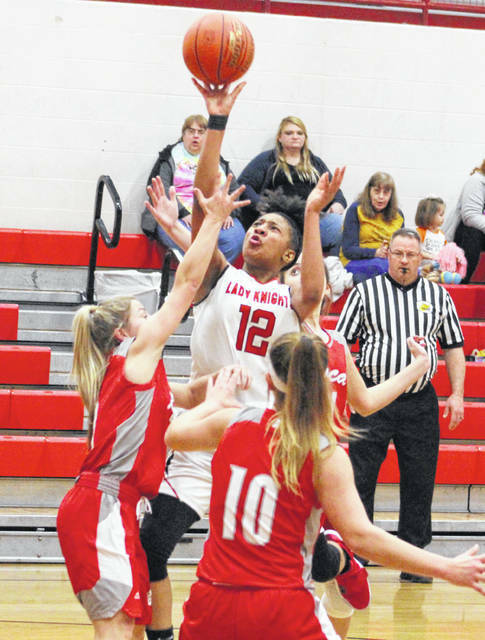 The Red and Gray, however, made a 10-0 surge over the final 2:35 and took their only lead of the first half following a Mercedes Bush basket with two seconds left — giving Poca a 17-16 edge at the break. DaNayla Ward regained the lead for PPHS with basket 10 seconds into the third, sparking a 6-0 run that extended the hosts’ advantage out to 22-17 with 3:32 remaining. Poca missed its first 13 shot attempts in the third frame, but still mustered a 4-0 run over the final 2:38 en route to closing the gap down to 22-21 entering the fourth. The Lady Dots claimed their final lead on a Smith basket 50 seconds into the finale, but Ward countered with an old-fashioned 3-pointer at the 6:49 mark — giving Point what proved to be a permanent cushion at 25-23. The Lady Knights then responded with an 11-4 surge that gave the hosts their largest lead of the game at 36-27 following a basket from Brooke Warner with 1:27 remaining. The Lady Dots closed regulation with a 13-6 charge, but ultimately never came closer than the final two-point outcome. Point Pleasant committed 29 turnovers in the triumph, but only three of those miscues came in a fourth quarter that saw the hosts shoot 8-of-11 from the field. Poca also committed three of its 24 turnovers in the finale and went 7-of-17 from the floor after netting just eight shots in the previous three periods. The Lady Dots dropped their ninth consecutive decision. Afterwards, Fields — now in his seventh season at the helm of Point Pleasant — noted that this was about as close to a quality win that he has enjoyed over the last few seasons with the program. As he mentioned, it was simply the fact that his kids showed some positive steps forward in the face of adversity. “We felt like this program was going to better this year than it had been the last few seasons, but I didn’t have any real expectations for them outside to grow and improve. Tonight, we showed just how far we’ve come,” Fields said. “It’s not just the turnaround from the first game with Poca until now. It’s about the way our kids kept battling through the ups and downs of the game and didn’t quit. I couldn’t have asked anymore from the girls than what they gave tonight, and it’s nice that everyone contributed to this victory. Point Pleasant outrebounded the Lady Dots by a 34-31 overall margin, but the guests claimed a 12-10 edge on the offensive glass. 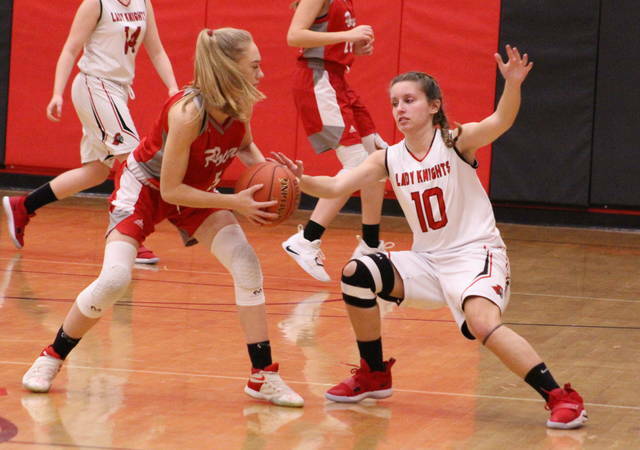 The Lady Knights netted 16-of-41 field goal attempts for 39 percent, including a 3-of-11 effort from behind the arc for 27 percent. The hosts were also 7-of-19 at the free throw line for 37 percent. Ward led the Red and Black with 16 points and nine rebounds before fouling out late in the fourth. Henderson was next with 11 points, while Warner and Meisser respectively added six and four markers. Nancy Vettese chipped in three points and Baylie Rickard completed the winning tally with two points. Vettese, Warner and Henderson also grabbed eight, seven and six rebounds, respectively. The Lady Dots made 15-of-56 shot attempts for 27 percent, including a 4-of-19 performance from behind the arc for 21 percent. The guests were also 6-of-9 at the charity stripe for 67 percent. Smith paced Poca with 16 points, followed by Devin Ord with 11 points and Bush with five markers. Zoey Williams was next with four points and Pontier added three points, while Liberty Gladwell completed the scoring with one point. Williams led the guests with seven rebounds and Pontier followed with six caroms. Point Pleasant will host Senior Night on Thursday when it welcomes Buffalo for a 7 p.m. tipoff.